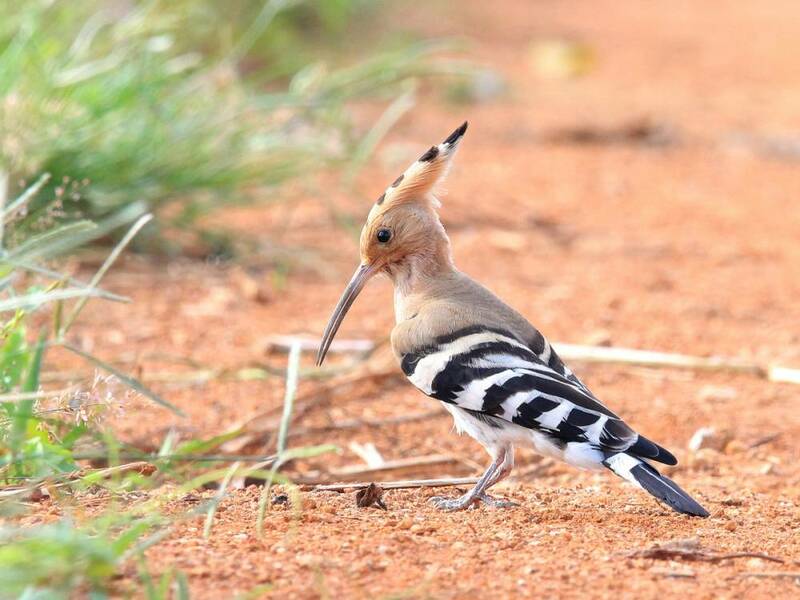 When I booked the lodge in Thrissur I especially selected the lodges close to the paddy fields, because most of birding spots near Thrissur are related to fields. Unfortunately now am staying not in booked lodge which is happens to be a fake. 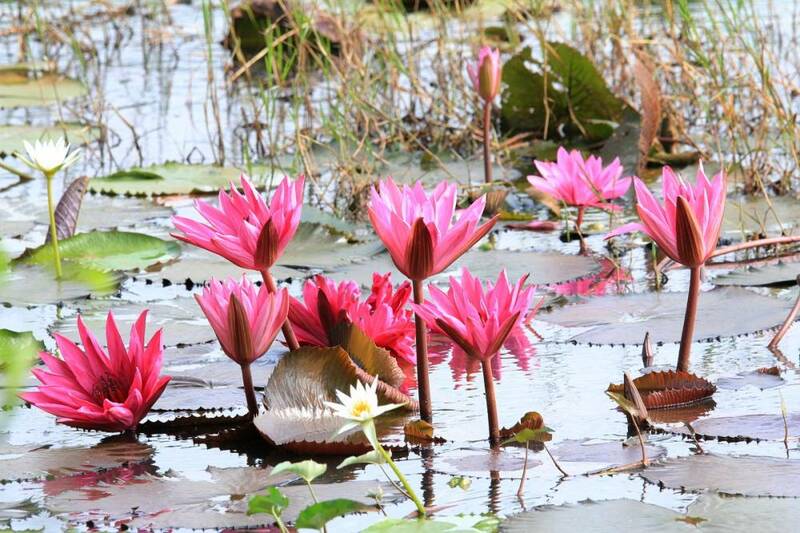 But in last 6th days I visited Kole wetlands in Puzhakkal three times using mostly bus as transportation mode. 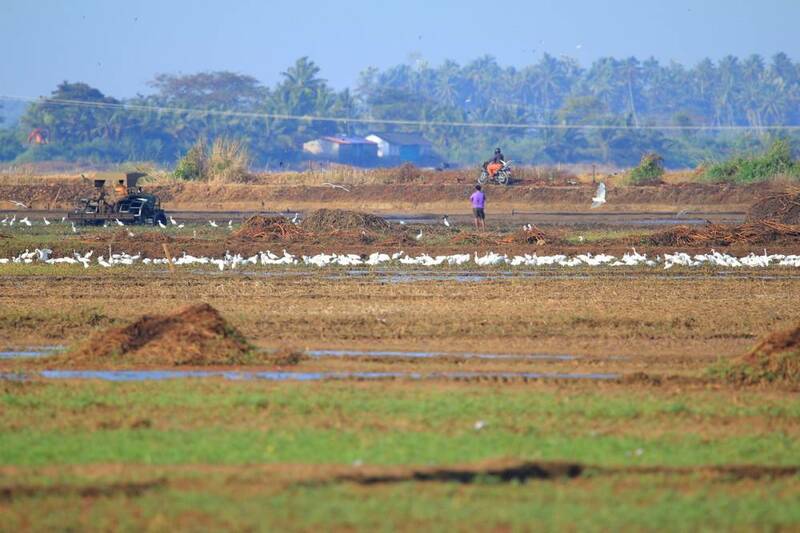 I separate whole territory to three main landscapes: paddy fields, river and channel with large trees in banks, and forest near village. Main landscape is of course fields. 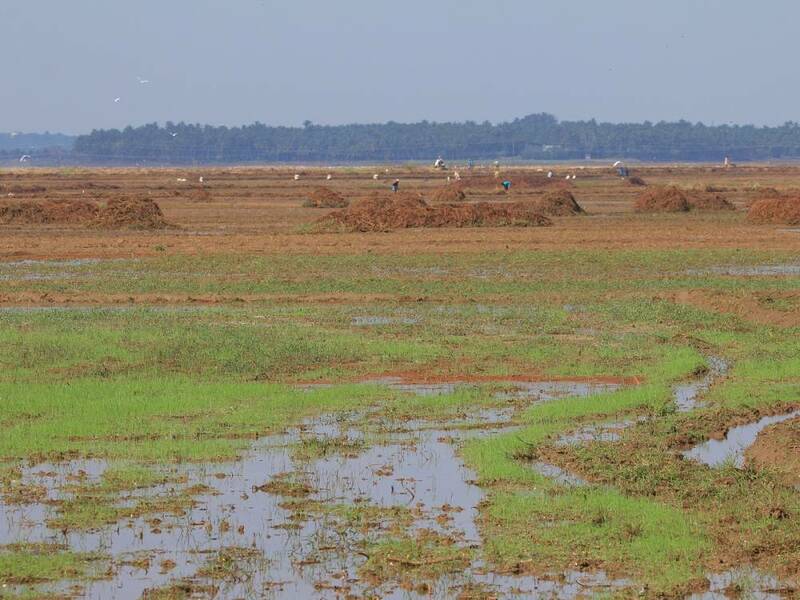 Now is seeding season (if I understand right), in some of fields there are working tractors and a lot of Egrets, mostly Little and Cattle Egrets, but I saw the Intermediate ones too. 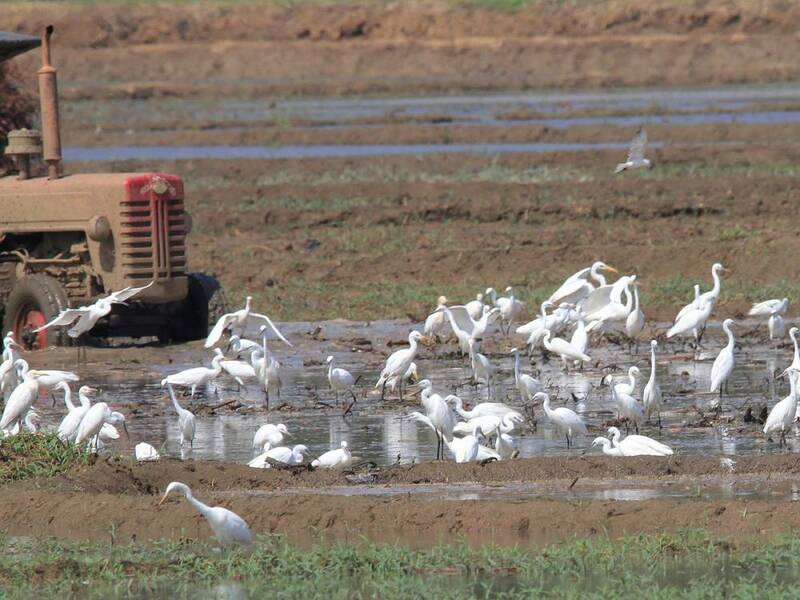 The Storks are feeding in watering blocks too. 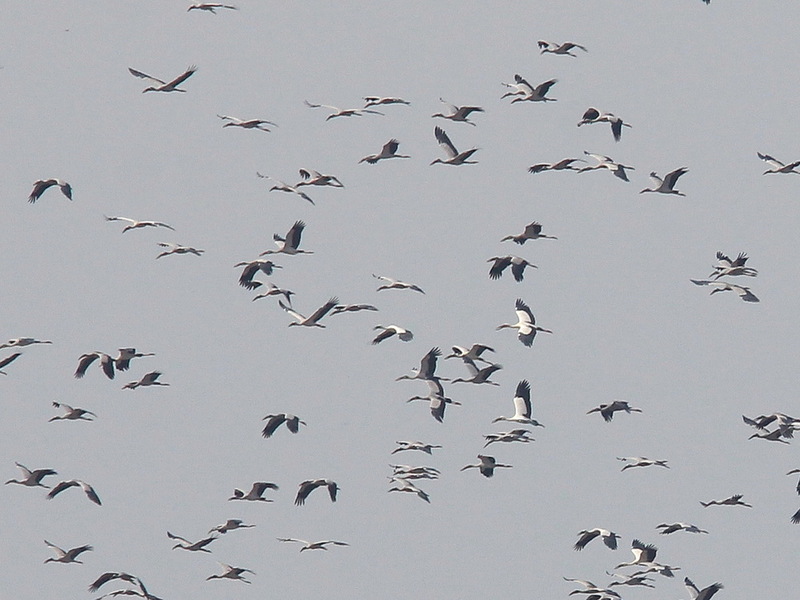 Once I observed the flock of more than 200 Asian Openbills was flushed by somebody. 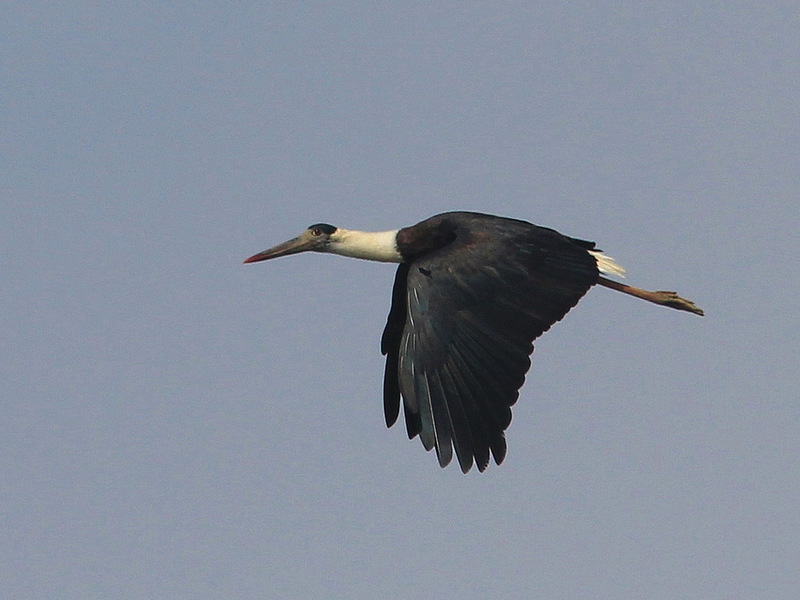 Also I regularly observed the couple of Wooly-necked Storks. 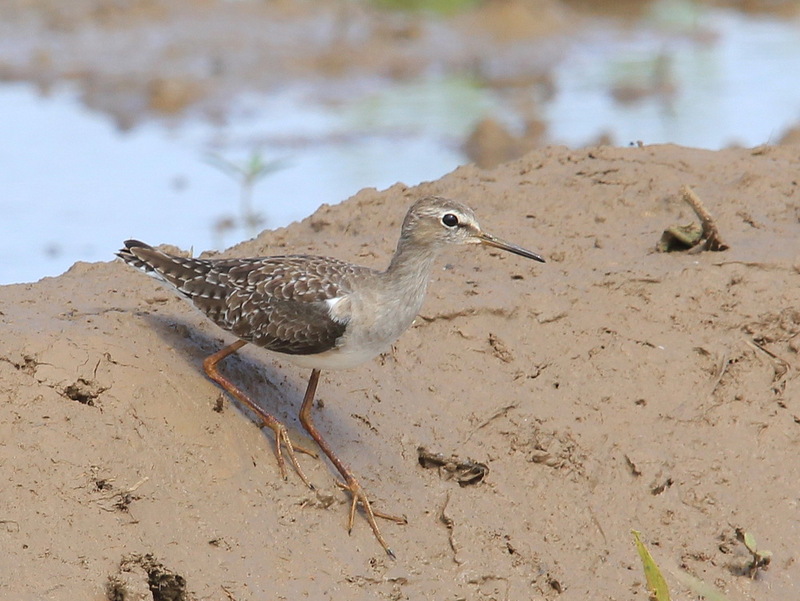 The blocks with the low water or mud are the places of feeding to Waders and Wagtails. Wood Sandpipers formed the absolute majority of Waders, I think more than 60%-70% of all Waders are Wood Sandpipers. 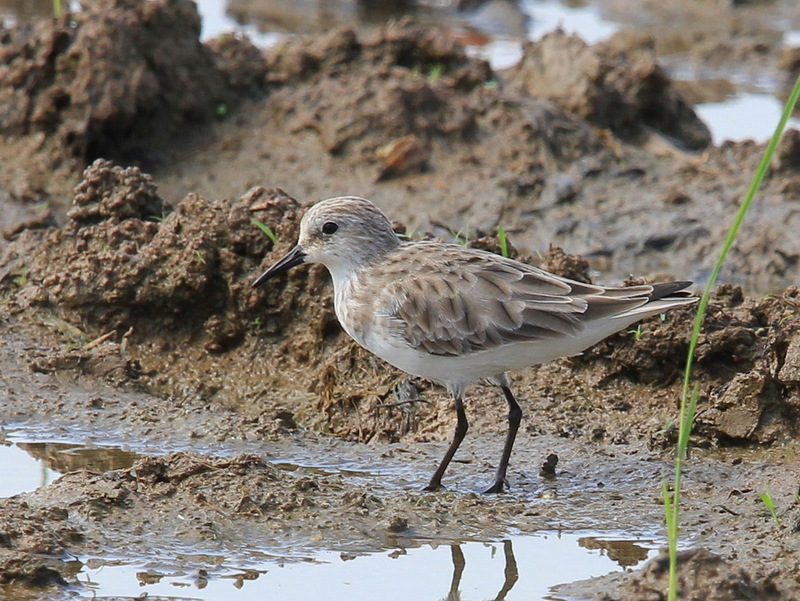 Other ones are Little Stint (I confused in id of this bird because I never seen it in winter plumage lack any of reddish), Temminck’s Stint, Lesser Ringed Plover, Common Sandpiper, and one specimen of Greenish Sandpiper. 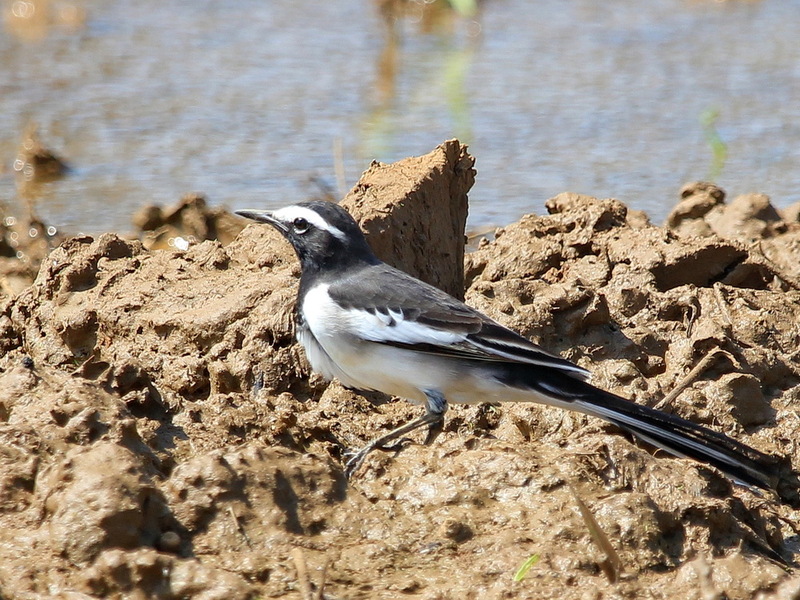 Of Wagtails I saw Yellow (most of all), White, Grey and White-browed ones. I should say I saw my first Lark in India, the Oriental Sky Lark. It was singing song. By the way, in Russian it called “Индийский жворонок”means “Indian Lark”. I didn’t deep to paddy fileds, watched mostly from the border of fiend and river. But I am going to do it next my visit. 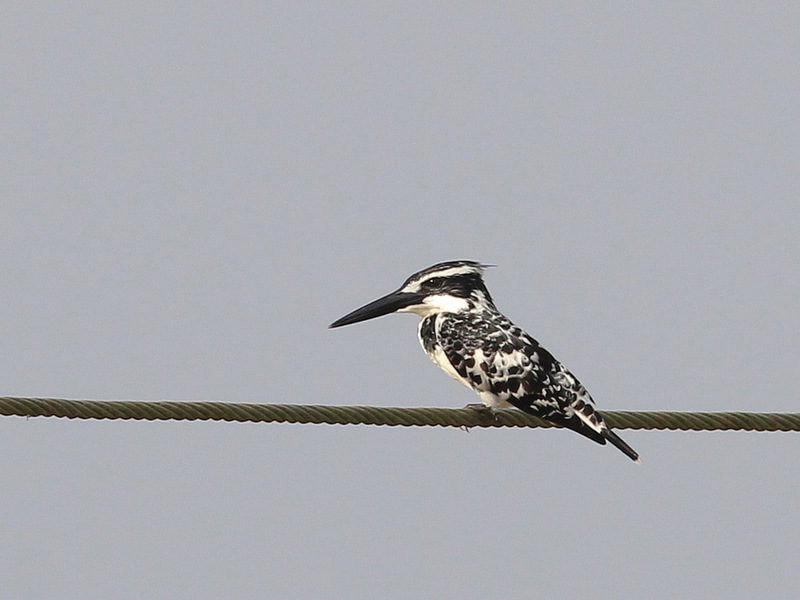 Large open areas, open sky, many birds, hope I will watch some other species. Regularly I watched birds of prey. Of course most popular raptor was Brahminy Kite. 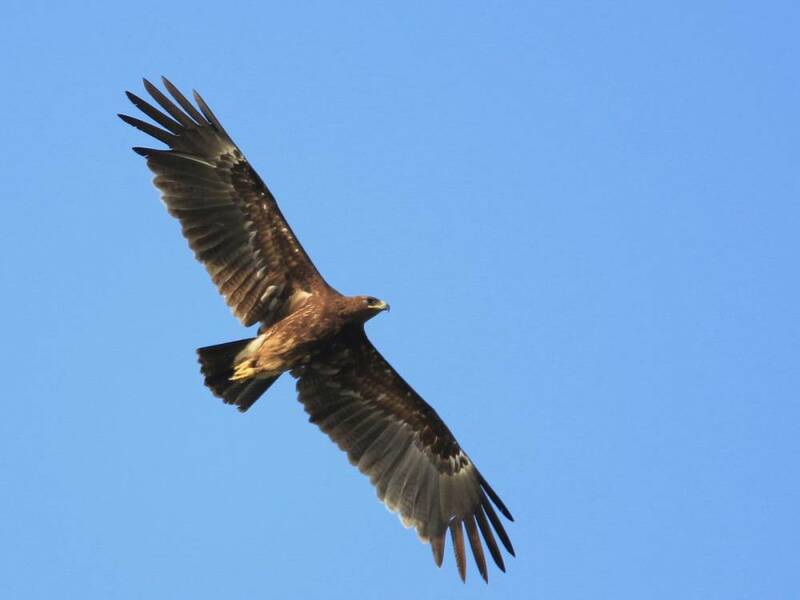 In addition to this birds I saw flying by Booted Eagle, twice Steppe Eagles (one together with Brahminy Kite), Oriental Honey Buzzard. In the forest once I noticed Shikra was flushed by me. 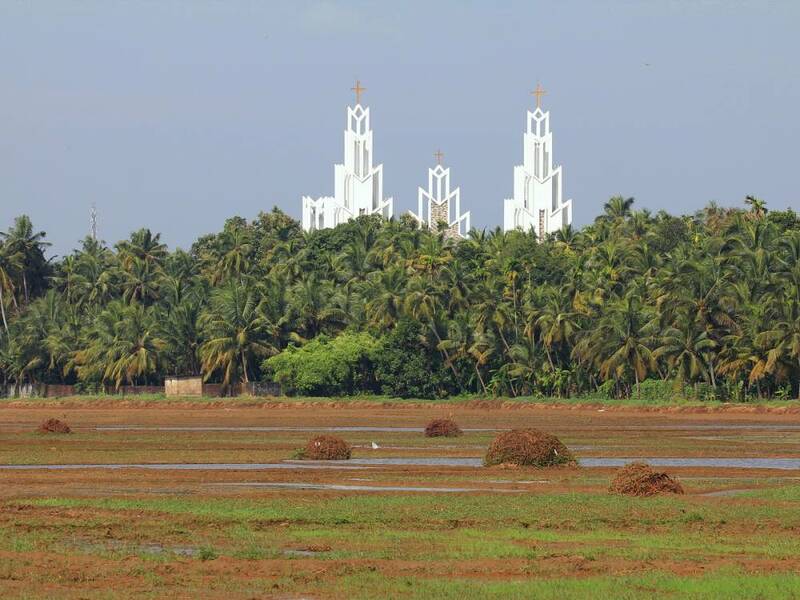 River Puzhakkal and channel is interesting too. 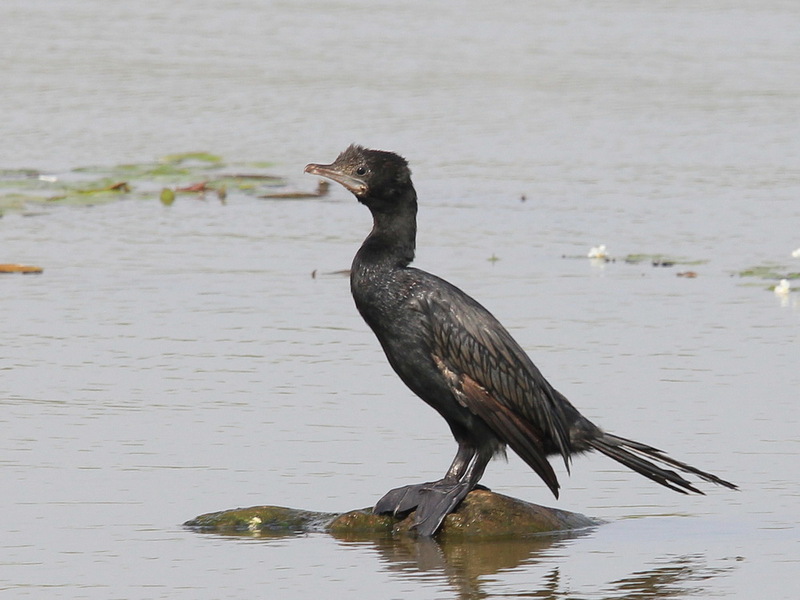 Sure I saw Little Cormorants, Herons and Egrets, and Oriental Darters too. But in addition to these common and expected birds I saw 2 species of Terns (may be common too, but I watch one of them first time) – River Tern and yet unidentified one. 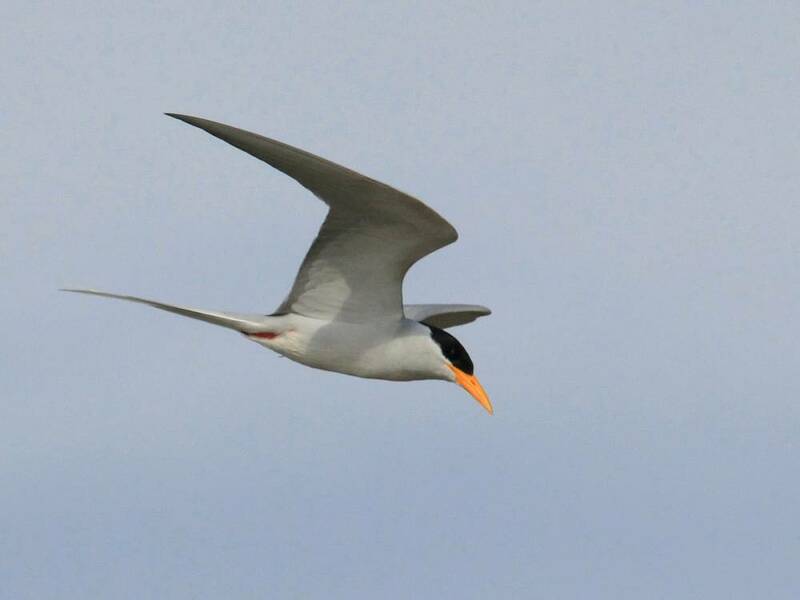 River Tern is large with yellow bill, second one is lesser with dark spots in belly in some birds. In my opinion it’s not similar to Gull-billed Tern which looks like large bird with long wings. 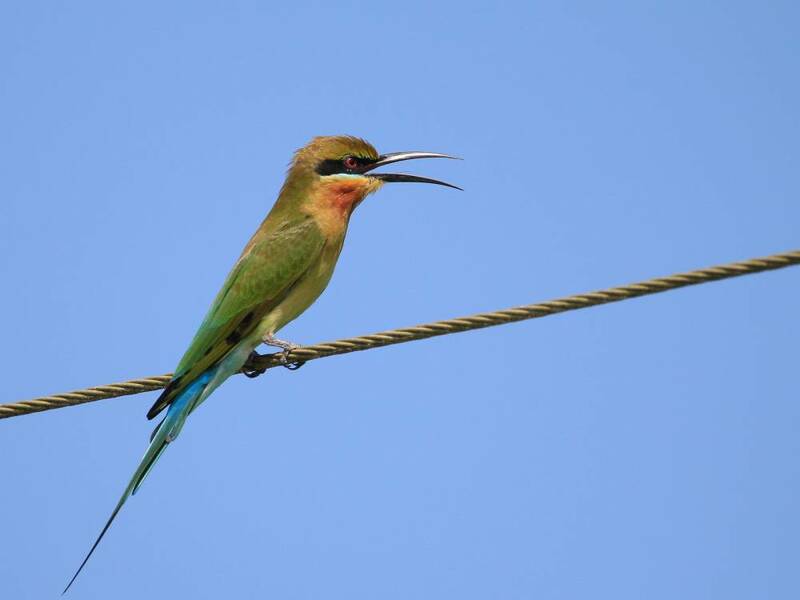 The wires along the river are used by the Bee-eaters and Kingfishers. 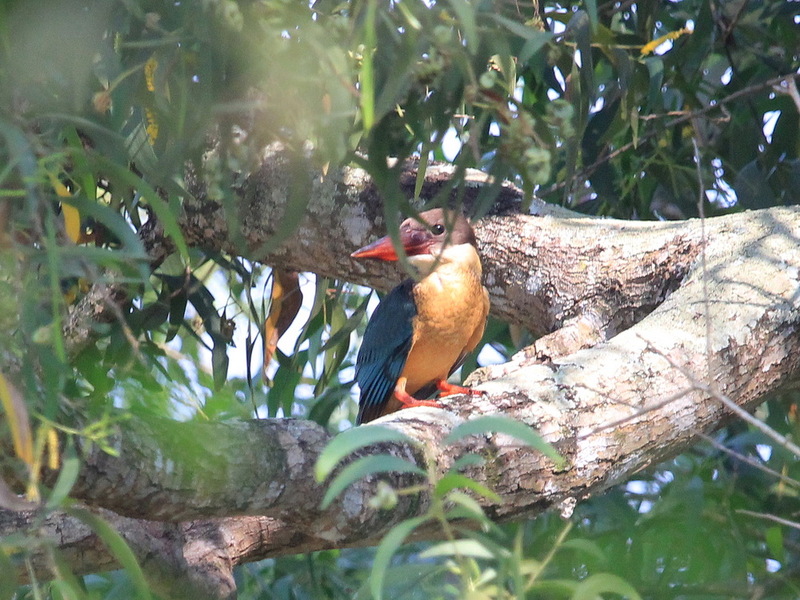 One day I saw 4 species of Kingfishers (Pied, White-throated, Stork-billed and Common ones). 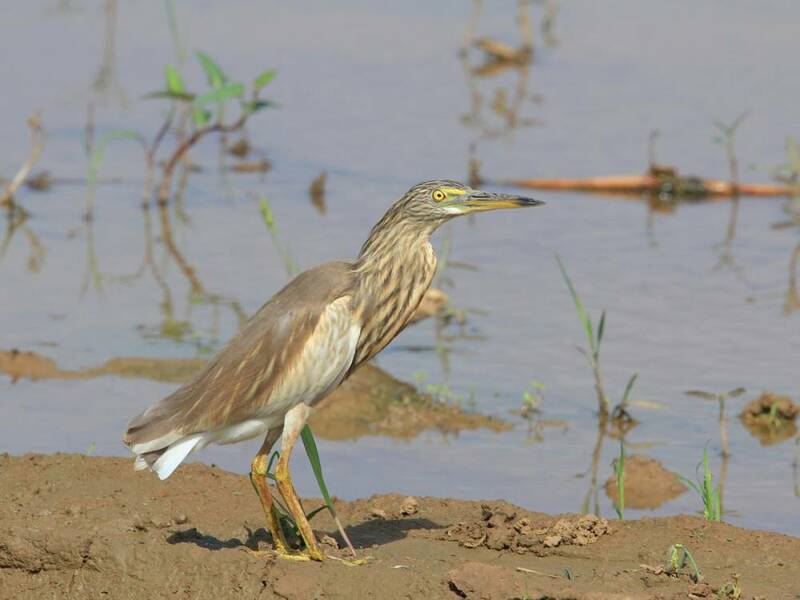 Some of birders believe that watching several related species in one day is great result. 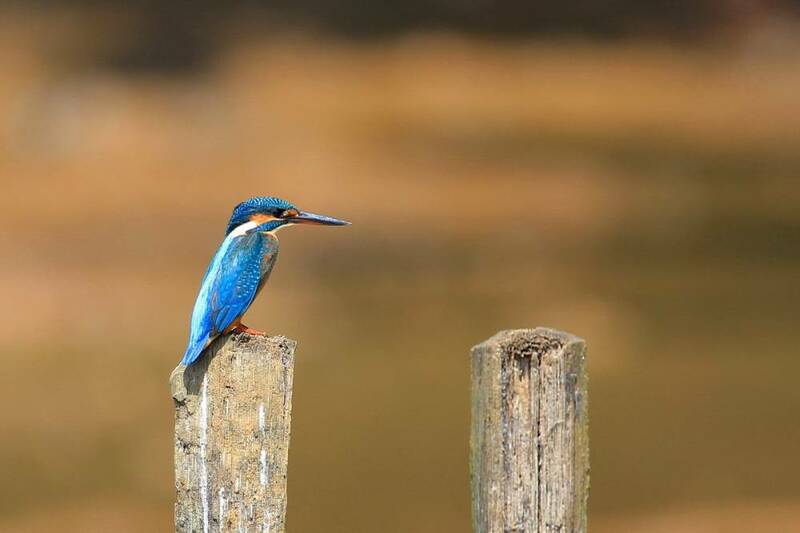 I watched 4 species of Kingfishers. By the way, I watched (at least) 6 species of Egrets/Herons and 2 species of Storks in the same day together with Kingfishers. 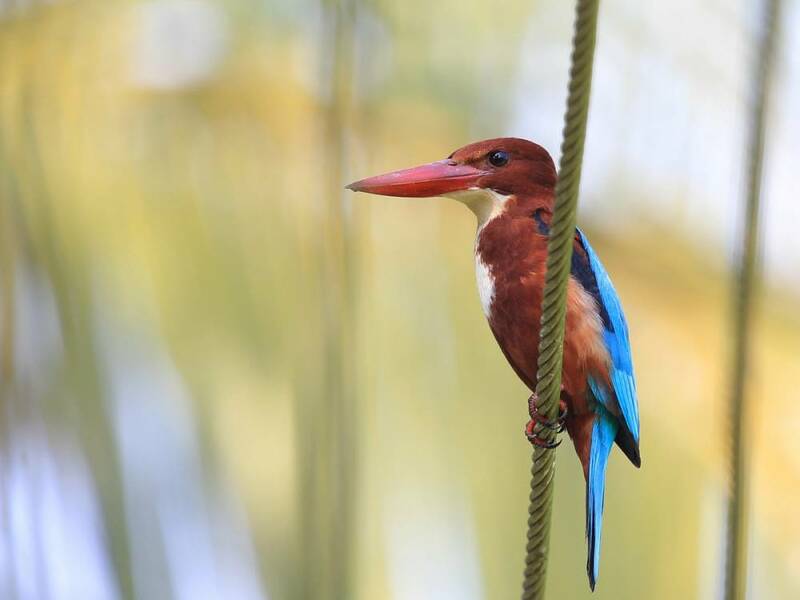 The most shy of Kingfishers is the Stork-billed one, I never seen it in open place but always either staying in the deep crown of trees or flying by. 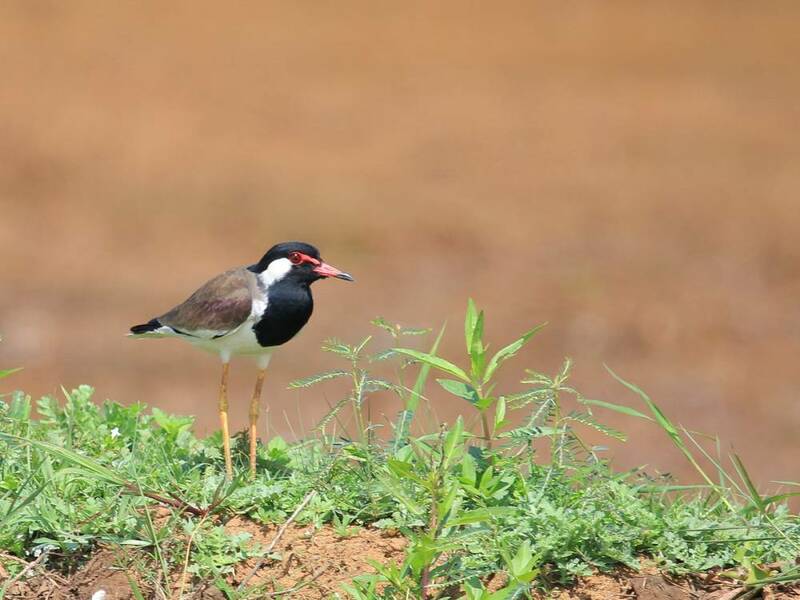 The trees and marshes of river’s bank are the habitats I watched many other birds including Red-wattled Lapwing, Hoopoe, different Starlings and Mynas and one bird which became my 100th species in this trip. I saw Ashy Woodswallow. 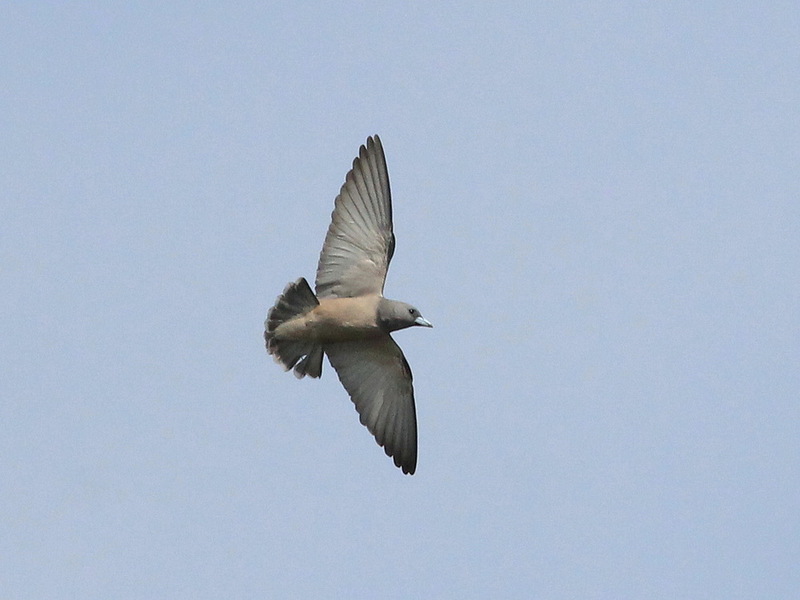 When I noticed it flying in sky I thought it’s Swallow, but it was Woodswallow. 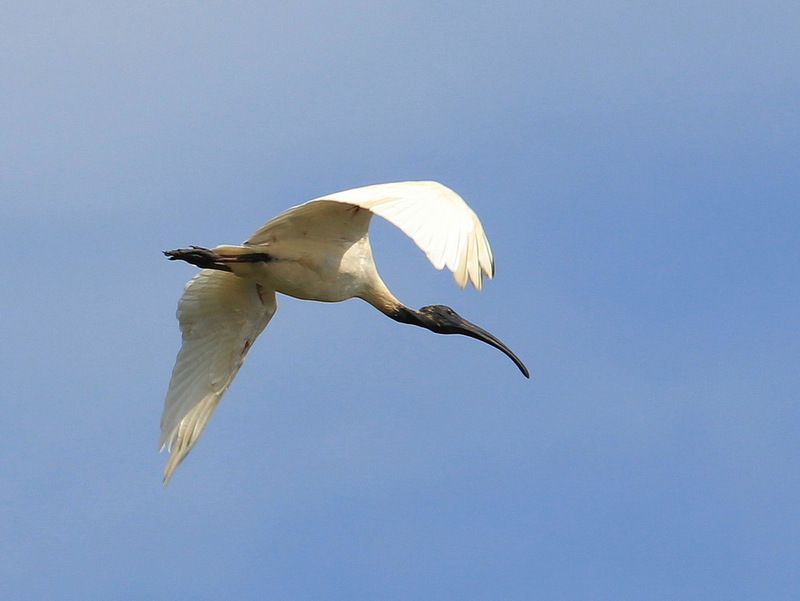 I thought it’s rare bird but I mistook, I saw it every visit. Once I saw 5 Woodswallows. One of birds regurgitate something, I later saw how another bird catching the butterfly ate it with the wings. Probably it later will regurgitate wings. Woodswallow is unusual bird, not alike to other birds. I met one young birdwatcher who told me many interesting and useful information, including the onfo about the large Owl he watched two days ago in the next forest. Next day I visited this forest but stayed there a short time, because I was uncomfortable when the road inside the forest passes between the houses. I think the local people also were uncomfortable when the stranger with big-lense camera is walking near their houses. But when I asked one family about Owl, we had quite a long time talking, and elder hoster gave me the coconut water. It’s great drink, especially after three-hours birding under the sun. I drunk about one liter of this nice juice. 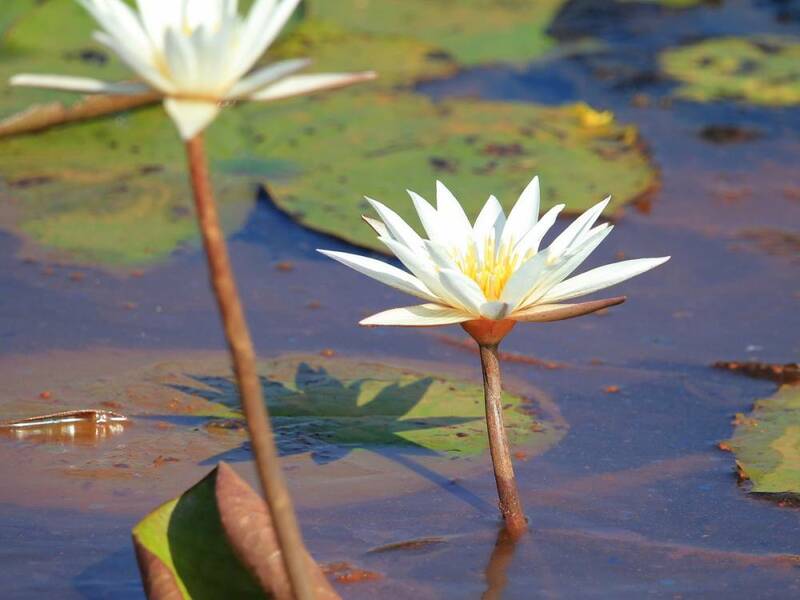 So I was in the forest a short time, and saw only Rufous Treepies, Shikra, Purple-rumped Sunbirds, and Asian Paradise Flycatcher hunting to Dragonflies, which also were the main prey of Blue-tailed Bee-eaters. That’s briefly report about my visits of Kole lands. 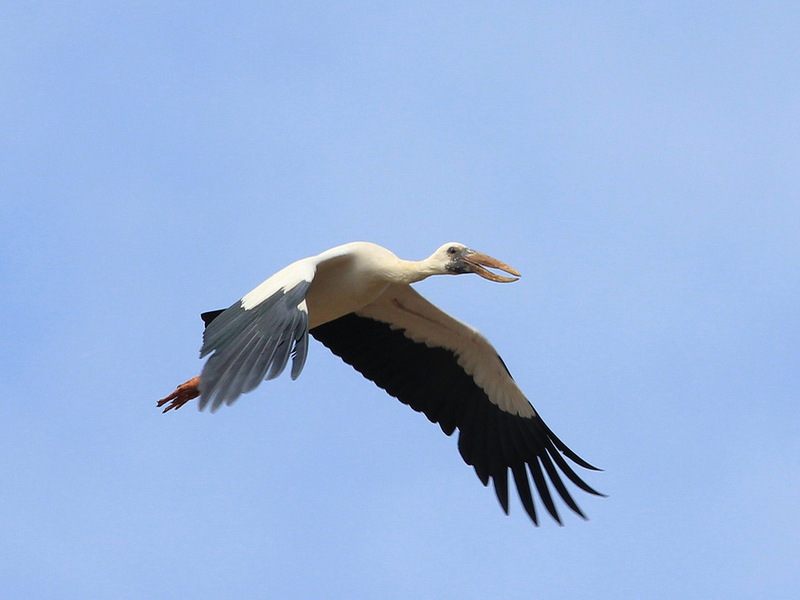 During next week I exactly repeat birding near Puzhakkal.